Deliver the finishing touch to a striking make up look with instant length, volume and intensity. The instant impact wand captures, lengthens, volumises and intensifies each lash from root to tip. The instant impact wand has short bristles, making it easier to reach every lash, which allows maximum contact between mascara formula and lash for instant volume. Whereas bigger brushes have longer bristles, which get in the way and make it difficult to coat each lash. The inside out wand combs through every lash from root to tip, coating them with our carbon black fibre formula containing volumising particles, which make your lashes appear thicker and in turn, darker and more intense. In addition to volumising particles, the innovative formula in our 3-in-1 mascara contains lash extending carbon-black fibres for thicker, longer and more intense lashes. Containing volumising prills which form spherical wax particles to make lashes appear fuller and 30,000 black carbon fibres this new mascara really volumises, lengthens and darkens lashes in a quick application. 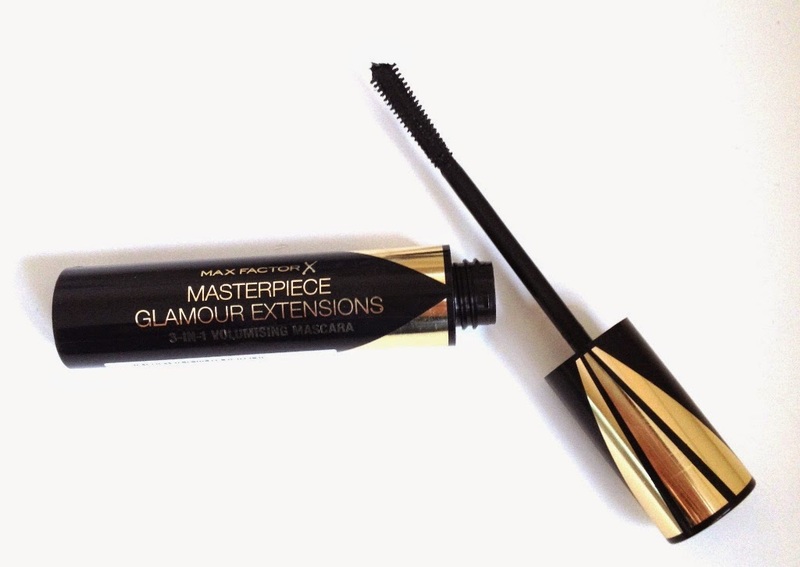 I have long been a fan of Max Factor as a brand, I have liked quite a few of the mascaras - they seem to love my lashes! So of course I was keen to try this new release, especially when it promises to do so much. As you can see from the pics above the wand is smallish, thin and the bristles are quite short compared to some other mascaras. The wand is also narrower at the base but widens at the end. I followed an application tip from Max Factor Make Up Artist Caroline Barnes - To achieve fanned out lashes use the wand in stages. First pull the inner lashes towards the nose, then pull the central lashes upwards and finally the outer lashes towards the temple. I liked this mascara although I am still baffled by its design.... the thinner, smaller wand does aid application and it does lengthen beautifully. The rich black shade stands out much more in real life than captured in the photo below and lashes are really defined. Volume wise Caroline Barnes recommends using the mascara in your usual way, I will try that next time but it doesn't do a bad job at all with the fanning out method. However.. the biggest downfall of this mascara is that just two hours after application it started to flake, in fact I think you can see evidence of this in the after photo. 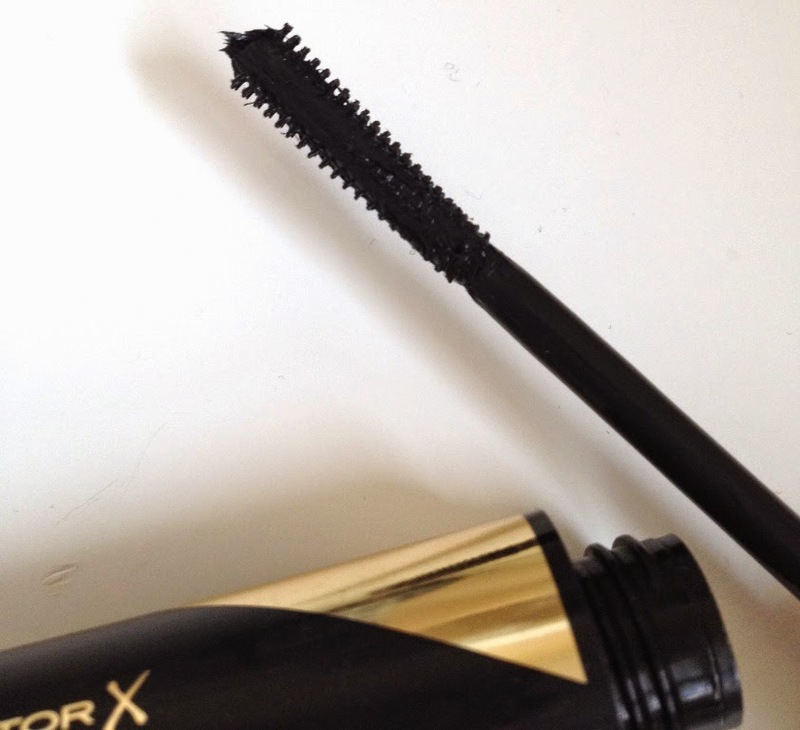 This was disappointing as the Max Factor mascaras I have used previously haven't done this. I wonder if this is the carbon fibres that are present in this version? Day 4 of Mascara Week on BeautySwot.com sees me reviewing Lancome Hypnose Volume mascara. This is a mascara that was launched way back in 2004, although there have been a few spin offs, the original is still being sold as its classic formula is one that has clearly stood the test of time. Turn up the look of volume of your lashes with Hypnôse! Build up to 6 times more volume without clumping. The PowerFull™ Brush helps deliver volume that you control. Glides through for lash separation and even application from base to tip. Apply to lashes from the base to the tips. Use a zigzag movement to add thickness and separation. This is a sample sized mascara that was part of a GWP but the brush is exactly the same as if you were purchasing the full size version. I really love this mascara, it provides lashes with a good rich black colour, it super lengthen the lashes and makes them look altogether luscious and plentiful. The brush is more like a traditional style of brush and it allows you to reach in and pick up every single lash with no mess. I like the fact that you can apply over and over if necessary and lashes are still soft to the touch. As you can see from the after pic lashes are also completely clump free and I do not feel like I am wearing any mascara. For real impact I have to say I love this mascara. 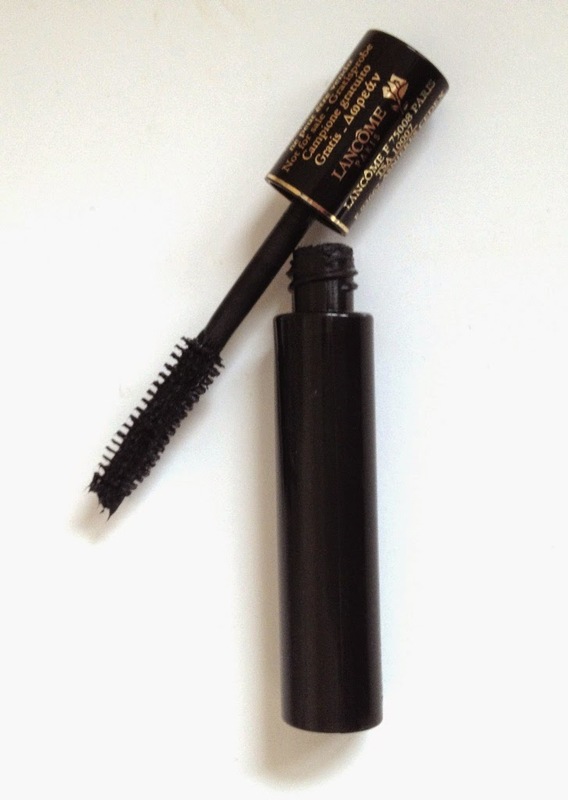 Lancome Hypnose Mascara costs £22.50 and is available in black and brown. 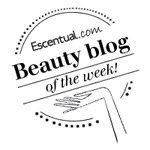 Day 3 of Mascara Week on BeautySwot.com sees me reviewing the brand new mascara from Benefit - Roller Lash. The one pictured above was a special sample sized mascara that was given away with the March issue of Elle Magazine. Unusually it was given away before it hit the shelves! Well I couldn't resist trying this new mascara out and so I promptly went to buy the magazine. The packaging on the sample version is slightly different from the actual full sized mascara. The lid on that one has a hair roller design. 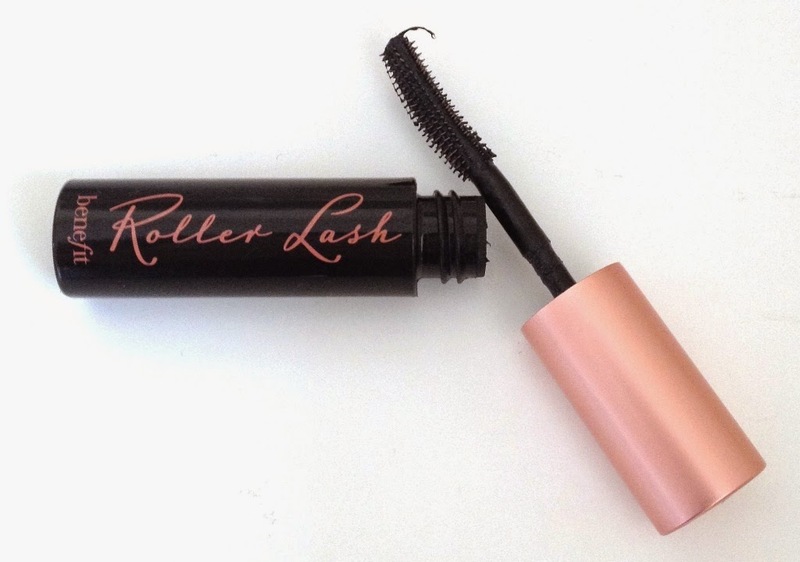 It’s a roller for lashes! The eye-opening Hook ‘n’ Roll™ brush grabs, separates, lifts and curls…while the instant curve-setting formula holds for 12 hours. Benefit's 'They're Real' mascara is one that has really split opinion, it seems to be one that you either love or hate. I personally LOVE it. I have so many comments asking me if I am wearing false lashes when I wear it so I give it a major thumbs up. However whilst I like this mascara, I just like it. I don't think I would be tempted to shell out almost £20 for it as I don't think the after warrants the price tag (on my lashes). There is no doubt it does what it claims, it does lift and curl the lashes but I would have liked to have seen a bit more thickening properties for me to have given it 10/10. It does also add pretty decent length as you can see in the pics below. The design of the wand means that application does get quite messy which is a bit of a pain. However it does also get extra points for its staying power, the curl holds all day. It also doesn't smudge or flake. This winter my usual scalp psoriasis has flared up and made its way onto my face, appearing in patches. When this happened last year I was told not to use a deep cleansing/exfoliating mask and so I avoided doing so until things improved. This year has been no different. 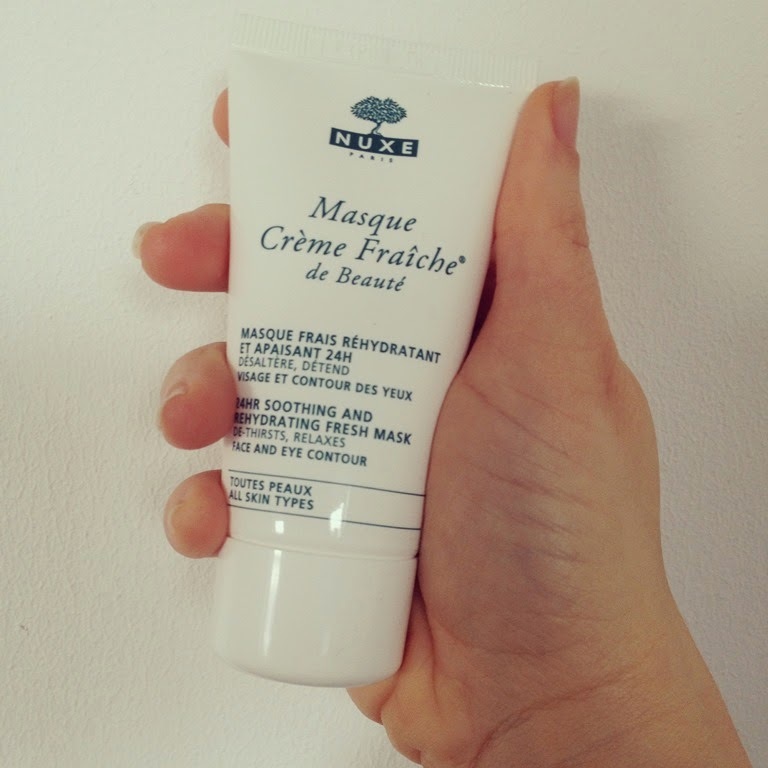 However, I felt like my face was missing a moisture boost/pamper and so I have been using Nuxe Crème Fraiche de Beauté Mask which has really helped plump up my skin, softened and brightened it and restored its glow after use. 24 hour soothing and rehydrating fresh mask. De-thirsts, relaxes. Face and Eye Contour. Suitable for all skin types. A source of well-being and immediate freshness, this moisturising mask with Plant Milks and White Blossom provides intensive moisturisation even for the driest skins. A rescue treatment, it provides intensive relief, instantly soothing skin discomfort. Hydrates and soothes for 24 hours, leaving skin radiant. As I said my face has patches of dry psoriasis and I didn't want to irritate it or aggravate it. This mask is creamy, just like a face cream but it feels cooling and refreshing and extremely gentle to use. It has the most wonderful fresh, floral scent. It contains 8 plant milks, aloe Vera Sap and Salicornia. It is enriched with Almond and Orange White Flowers and it intensely soothes skin bearing any discomfort such as stinging, redness or sensations of heat. To use - Apply to face and leave on for 10 minutes, either wipe off with a toner or massage in the excess. Results - skin feels softer and looks instantly more radiant, ready for the rest of your skincare regime and makeup application. 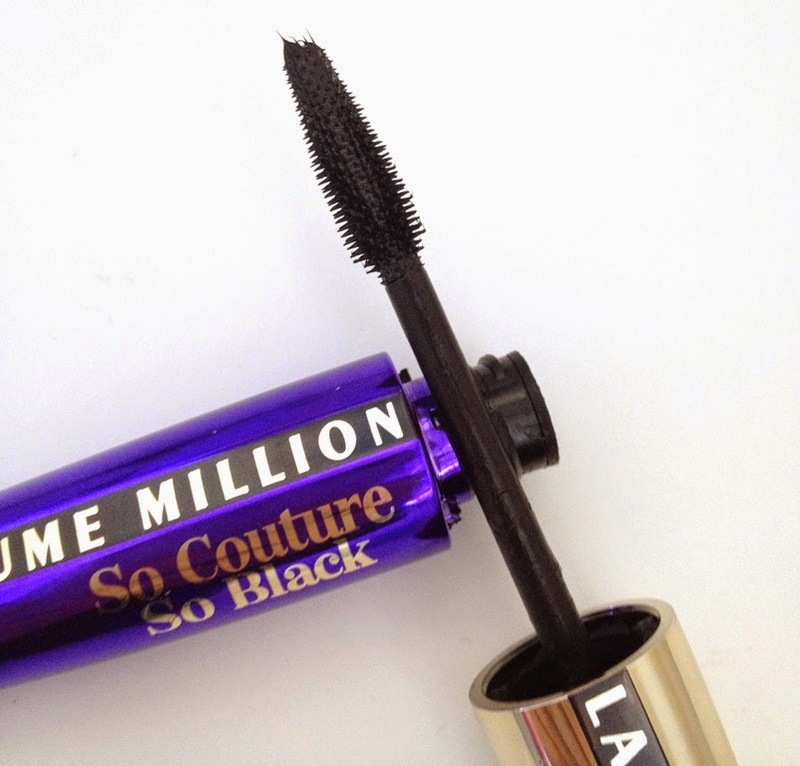 Day 2 of Mascara Week and I am reviewing L'Oreal Volume Million Lashes So Couture Mascara. Now the original Volume Million Lashes is one of my favourite mascaras so I had high hopes for this one. 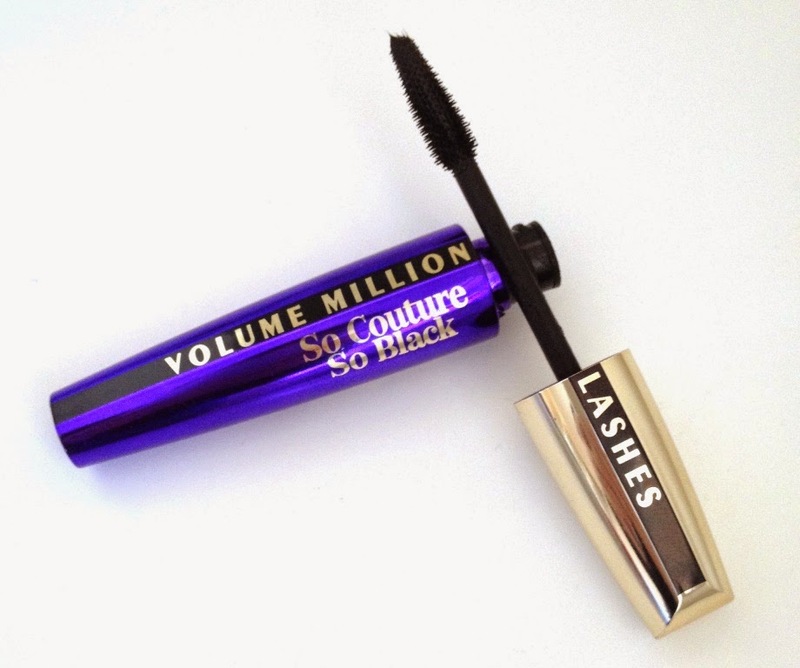 Volume Million Lashes dresses your lashes in a liquid black silk for lash by lash definition. The Couture brush has been tailored by experts to coat every lash without clumps. Its extra soft & small bristles gently thicken the look of each lash while its rigid wand enables you to spread the formula evenly from root to tip. This mascara came as part of a gift with purchase when I bought two L'Oreal L'Extraordinaire Liquid Lipsticks. My lashes seem to like the rubber type of wands and the shorter bristles. I find this wand really easy to use and it certainly grips every single lash which you will see from the after photo later. 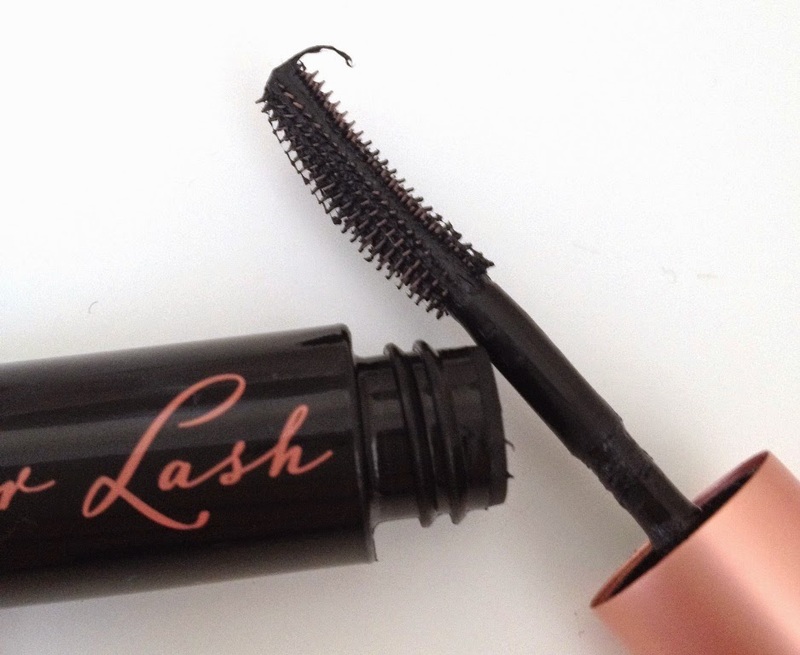 The mascara coats my lashes with a wonderfully rich and dark black colour. I have reasonably dark lashes already so I chose the 'Extra Black' version for real impact and it doesn't disappoint. As the name suggests it gives fantastic volume to the lashes and fans them out. The only thing it doesn't really do is curl the lashes. That isn't something that bothers me too much as I really like the result and the definition that this mascara gives. As for wear I don't find it smudges or flakes at all through the day. I would buy this again most definitely. 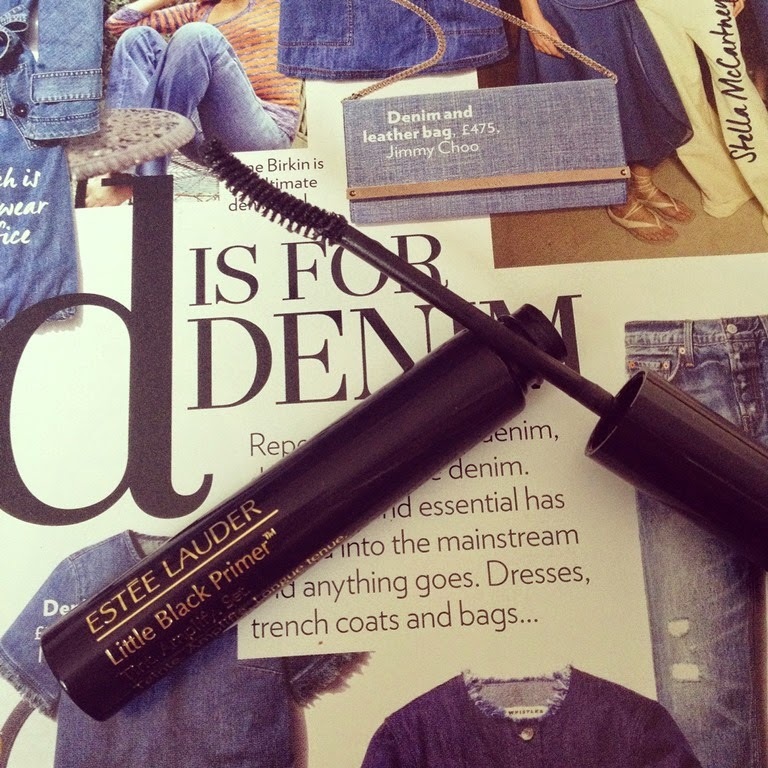 Estee Lauder are asking us to think of it as a Little Black Dress for the lashes - another perennial and wardrobe essential. - Tint: Colours and lifts bare lashes so they stay silky black throughout the day and even overnight. - Amplify: As a primer, it’s the optimal mascara base for volume, lift and length. - Set: Brush over mascara for a long-wearing, water-resistant topcoat that helps reduce smudging and flaking. Tint - I already have dark lashes so for me the first use as a tint was pretty ineffective. This would be fantastic for those with lighter lashes but made little or no difference to my lashes when worn alone. Amplify - As a primer this is just fantastic, unlike traditional lash primers which are white this is a black one and one single coat helps improve a mascara immensely. You need less of your usual mascara, it thickens lashes (something I personally am looking for in a mascara), it lifts and lengthens beautifully. Full marks as a primer. Set - Once again I was suitably impressed. 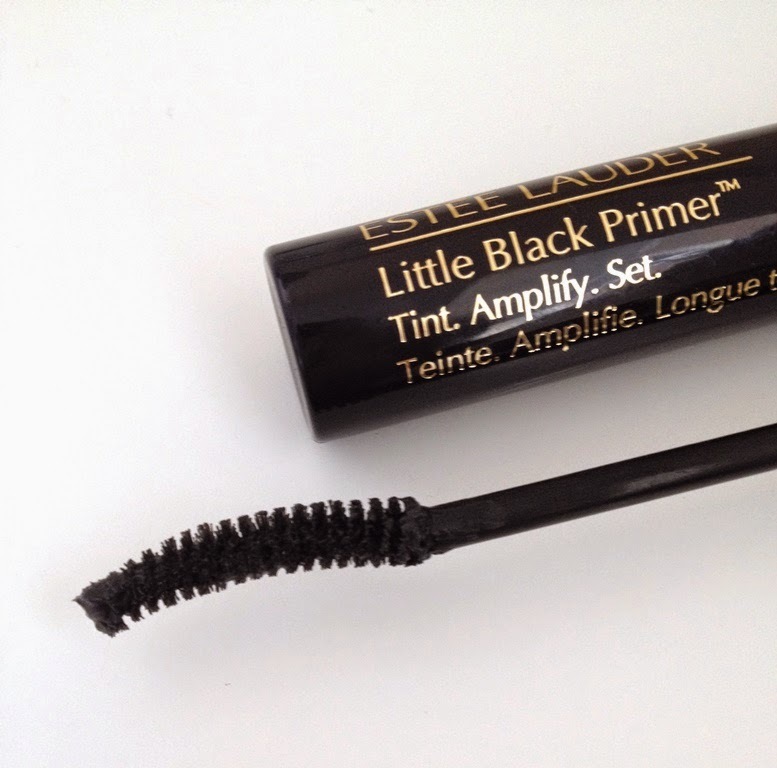 The Little Black Primer when used over your usual mascara sets mascara beautifully for no smudging or flaking at all. It also holds the lashes in the uplifted position and so the result is that mascara looks as fresh as the time you applied it (for me this lasts from day to night). For me is the bonus that I can make any of my mascaras waterproof by applying this over the top. Excellent! I love the curved thin brush as it allows a non messy application and coats every single lash. I won't use any mascara now without setting it. 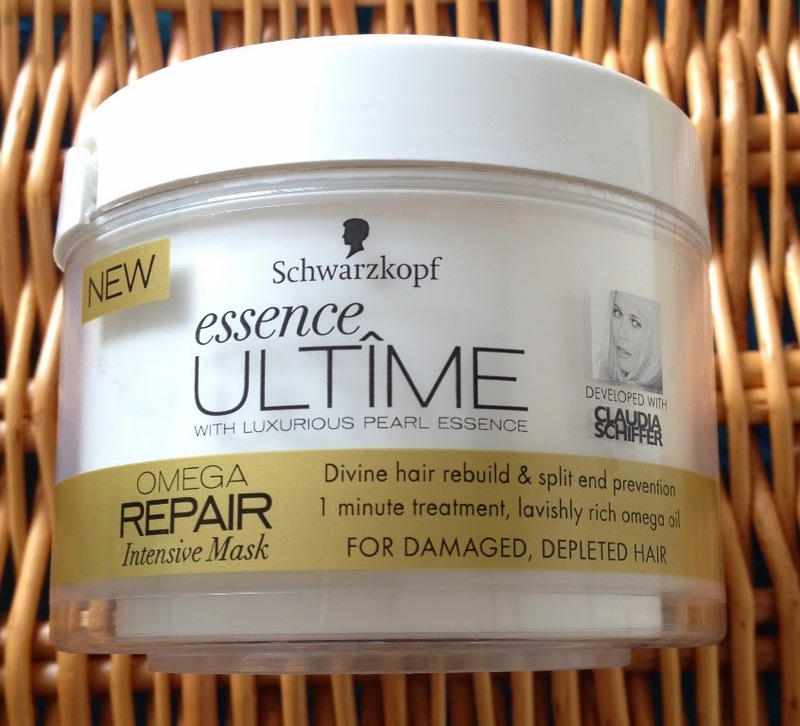 Developed with Claudia Schiffer, the Schwarzkopf Essence Ultime Omega Repair Intensive Mask combines her beauty insights from catwalk shows and fashion shoots, with the hair expertise of Schwarzkopf to become the reference for truly beautiful hair. The divine, extra rich mask for intense nourishment in 1 minute repairs inside damaged hair cells & reduces split ends. No more waiting around in the shower! A unique combination of pearl essence, panthenol, refined protein & keratin. Indulge your hair with luxurious care: Experience Claudia Schiffer’s beauty secret. I am a huge fan of intensive hair masks that only need one minute of my time to work. Let's face it, as a busy mum I don't have the luxury of many long pampering sessions but I still want to look my best with minimal effort... I have loved Claudia Schiffer since I was a teenager and the idea that I too could have her luscious hair using this product appealed! The answer is yes. This lovely rich, thick and creamy mask smells utterly amazing. You just apply it to wet hair after shampooing, wait one minute and rinse off. I could see and feel the difference in my hair immediately after drying - softer, smoother, sleeker and altogether healthier looking hair. I will definitely be using up the entire pot. A fabulous and indulgent hair mask at a great price. The latest limited collection from The Body Shop is really quite special. I love the bathroom shelf appeal of the dark but bold packaging which instantly appeals. Even better however are the products. I was sent a few items from the Smoky Poppy range which is infused with poppy extract from Turkey. The collection features no less than seven skincare and fragrance products, everything from body scrubs, oils and lotions to a shower gel and fragrance. The lightweight lusciousness of our Smoky Poppy Body Lotion leaves skin moisturised, feeling desirably soft and sensuously smooth. I love the scent of this light body lotion, it has a gentle warmth but retains a certain freshness to it. The lotion is light and easy to apply, absorbing almost immediately and leaving skin feeling super soft and hydrated. This fragrance contains a captivating blend of sultry spices, elegant florals and earthy woody notes. You’re only a spritz away from seduction. This tiny bottle spray is perfect for travel. The scent is deep and sultry with spices, woody notes and intense florals. However although the scent is seductive and smoky...as it is an EDT it still manages to be light after the initial first spray in which its heaviness doesn't last. I would say though that personally for me this isn't really a Summer scent but more of an Autumn/Winter scent so it is curious that it has been launched now as we are going into Spring. I like its warmth for the colder days. I love the idea of specific 2in1 products for the lip and cheek but have found that I tend to prefer the product for one or the other .. however in the case of the Lip & Cheek Velvet Stick I am pleased to say it works equally well as both. 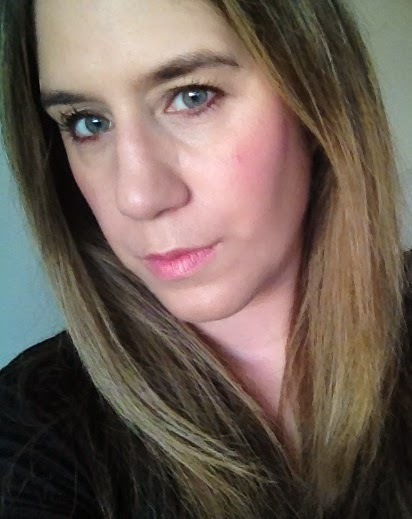 I have been wearing shade Poppy Bronze which is a gorgeous pink/peach shade. Give your lips and cheeks a naturally flushed glow with our first chubby sticks. Enjoy a colour sensation with an exquisite velvet matte finish. 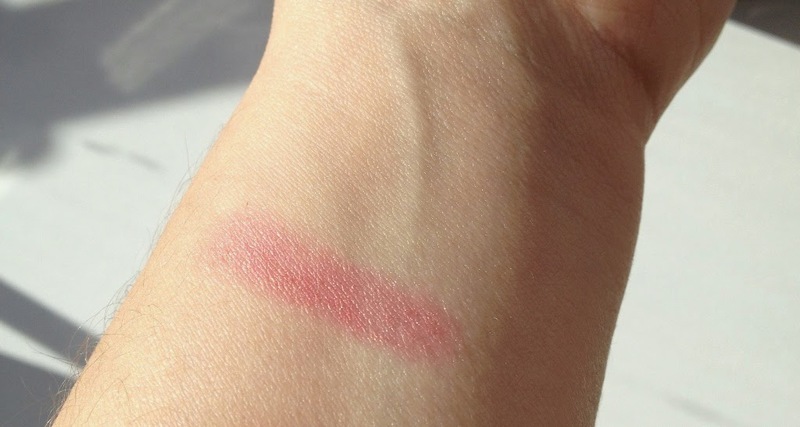 This chubby stick style product is really easy to use and a simple application on the cheeks and a bit of blending and the result is a beautiful natural and healthy, radiant looking flush. I loved the glow it gave to my cheeks and it lasts. Despite stating that this gives a matte finish I find that the finish is slightly frosty when worn on the lips, personally this isn't a problem for me as it all added to the overall 'glow'.It isn't drying on the lips either but you do need to ensure your lips are in good condition as it did highlight any dryness. I found the colour more like a tint at first, but it is buildable so you can get a stronger, deeper colour if you prefer it. 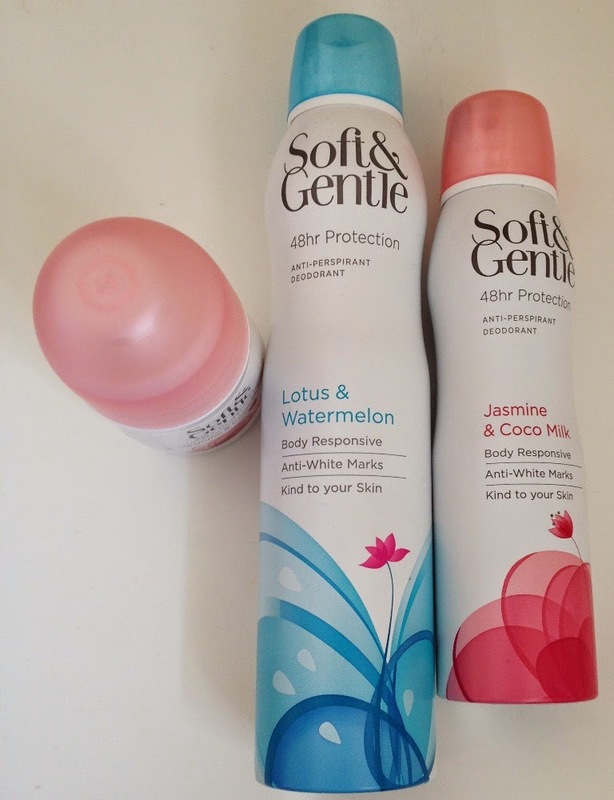 I have been using some more products from the Soft & Gentle range and true to their word they feel gentle on the skin, do not irritate the delicate under arm area. You can rely on them to keep you dry and protected and they don't leave any white marks on clothing, best of of all they smell gorgeous. Soft & Gentle Anti-Perspirant Deodorants offer dependable protection around the clock. Working in harmony with your body, they moisturise your skin while keeping you fresh and dry. Specially formulated to leave no white trace on your clothes, you’ll feel confident and protected all day long. This has a sweet and creamy milky scent which is lovely. I have used both the 150ml spray and the roll on versions and both are equally good. The introduction of Afternoon Tea, a quintessentially British tradition, is usually credited to Anna, 7th Duchess of Bedford, in the early 1800s. 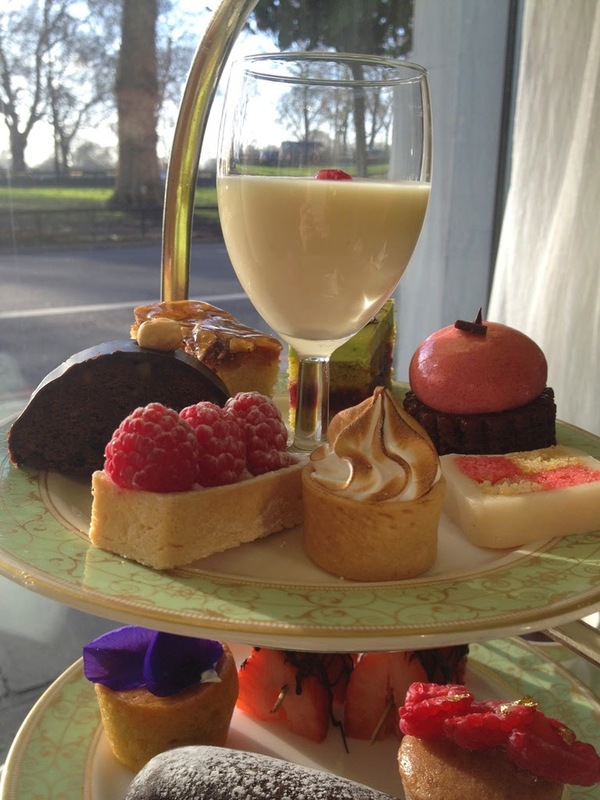 It is therefore only natural that the Grosvenor House London should name their traditional Afternoon Tea Menu 'Anna's Tea' in homage. 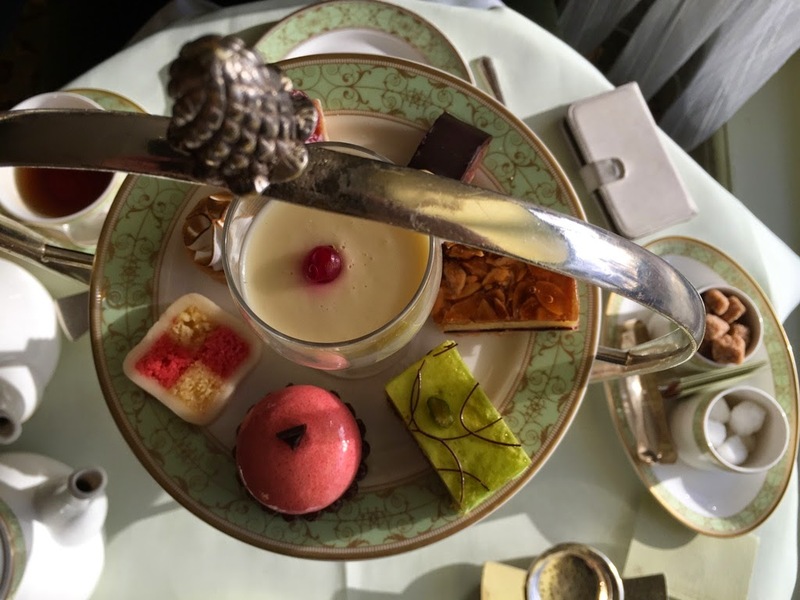 Recently I was invited to experience Anna's Tea for myself and one cold Saturday afternoon in January my husband and I headed off to Park Lane to partake in an afternoon of food indulgence. Afternoon Tea is taken in the Park Room which is a spacious, relaxed and almost homely room with nice cosy touches and a variety of seating arrangements and table sizes. As there was just two of us dining we were given one of the sought after window seats and enjoyed the sunshine spilling onto our table. The window seat meant we could watch the world going by and those outside could peer in and see us having afternoon tea. Actually, it was really nice as the majority of people smiled at us as they went by and saw what we were having. London felt very friendly that day. To start we were brought a fruit palette cleanser - a small glass of fruit juice packed with fruit pieces. 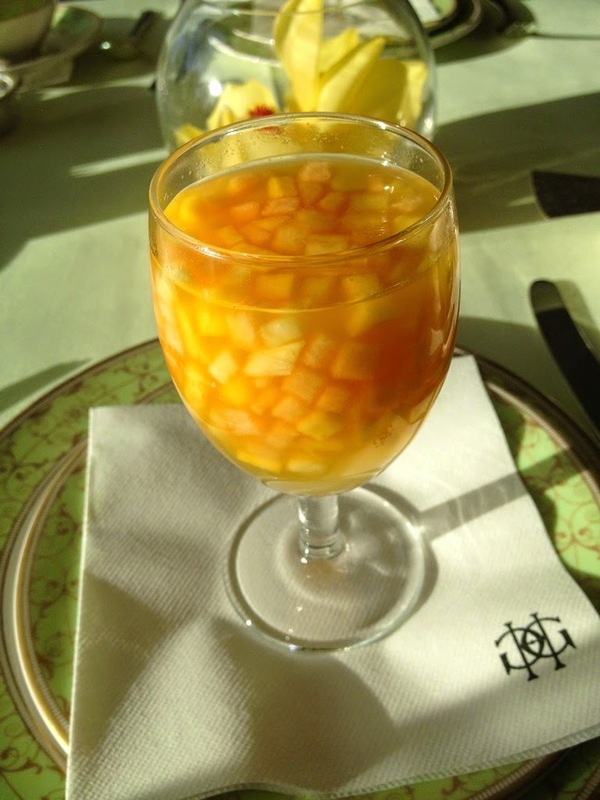 Such a refreshing way to start our afternoon tea. We then selected our teas from the wide variety on offer. We opted for the Grosvenor House Royal Blend - A smooth black tea that was packed full of flavour but was delicate enough not to need milk or sugar, it was the perfect choice to accompany the afternoon tea. Although I must confess that after the scones I did ask to change my tea to a Rose Tea but only because I adore rose teas and wanted to taste the one on offer on this tea menu. 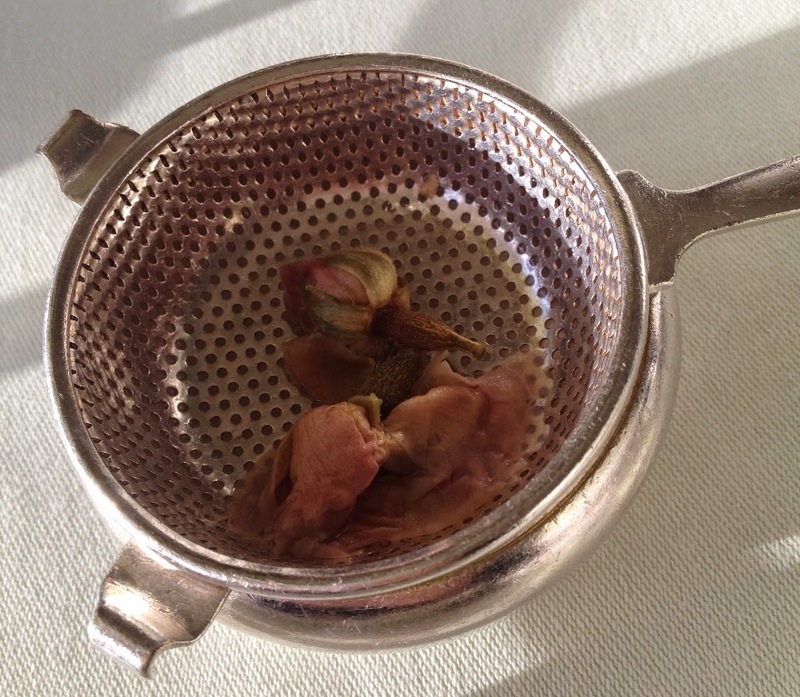 It was gorgeous, a light, floral tea with a hint of rose, it smelt wonderful and I liked seeing the rose buds pour out of the tea pot. As my husband is dairy intolerant (and I had informed the restaurant beforehand) he was brought our his very own selection of sandwiches. 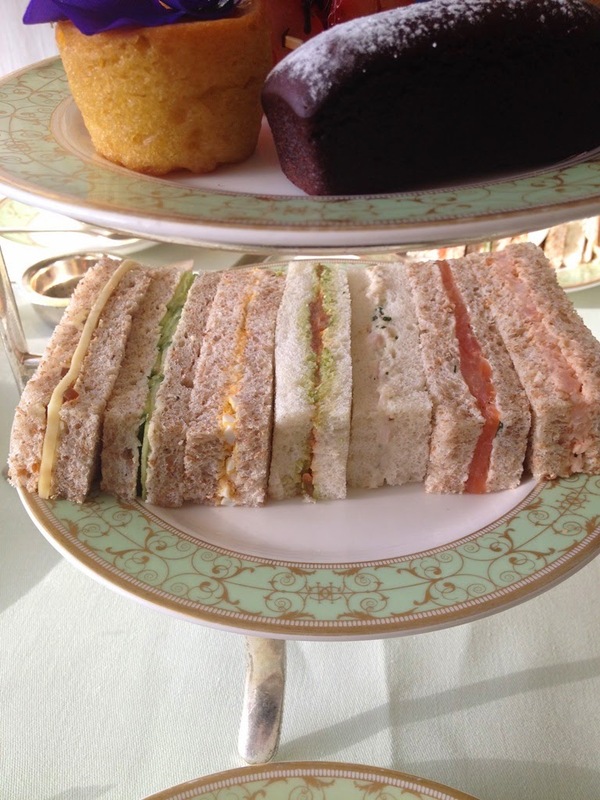 There were no less than six different choices of finger sandwiches on white or brown bread which I thought was really impressive and it certainly kept my husband full too which was fantastic. There was the usual mix of chicken, egg, salmon and more. All lovely and not a bit of dried bread in sight. We were offered more sandwiches but we were already more than full so chose not to take any more and moved on to the scones. These were brought wrapped up in a napkin to keep them warm, we had two each - one plain and one fruit. They were the perfect size, not too small or big and they were slightly crispy on the outside but soft and fluffy inside. Delicious. 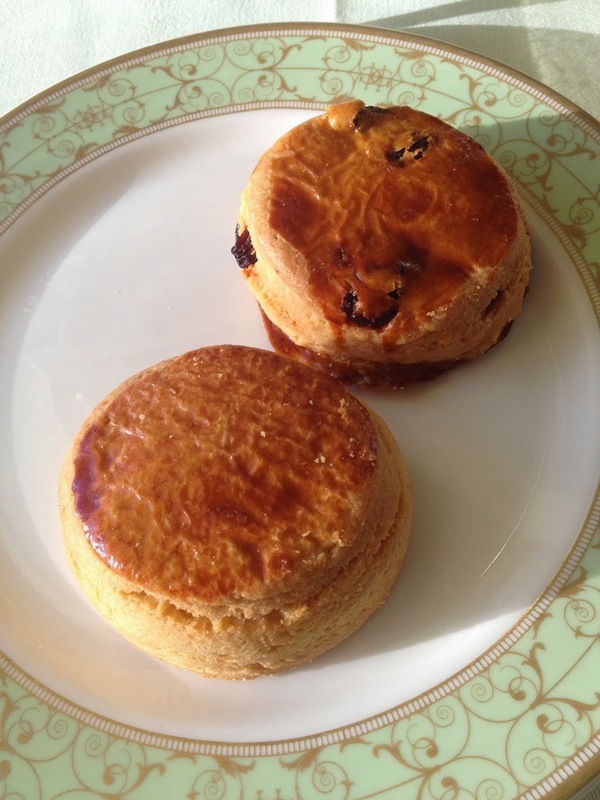 I personally like my scones just like this so I was pleased. 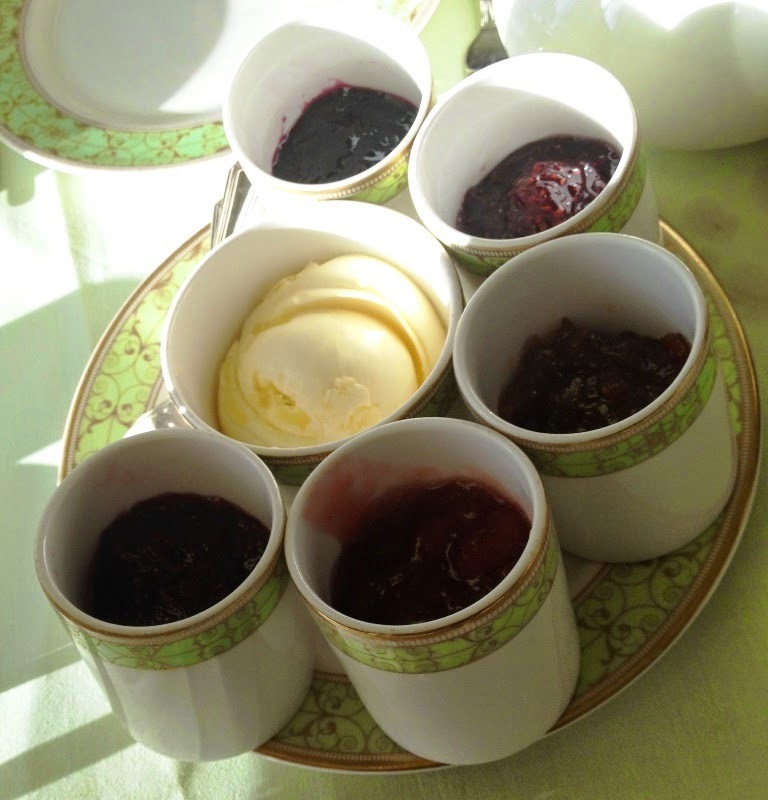 With five choices of jam to go with the clotted cream, I felt thoroughly spoilt. 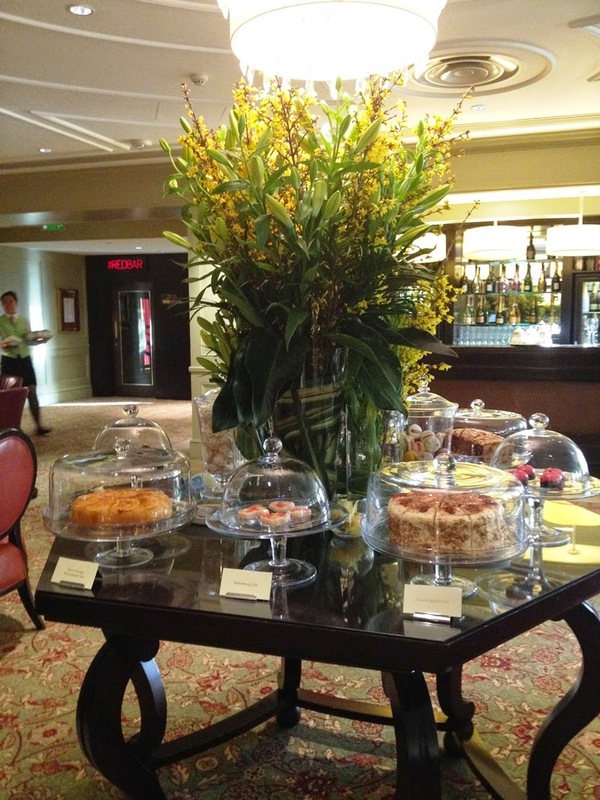 Luckily there was still room to enjoy the cakes that had been looking at me ever since they were brought out and once again the hotel came up trumps going to a huge effort to accommodate my dairy free husband. There literally was no compromise for him, he had a good mix of cake and fruit covered in dark chocolate. He was absolutely delighted and really, really enjoyed the selection he was presented with. He was so enamoured he told the waiting staff to send his compliments to the chef! I was equally enthralled with my sweets - mine were the ones pictured on the top layer. I can honestly say this was one of the nicest and tastiest selections of bite-size mini cakes and desserts I have eaten having Afternoon Tea - the choice appeared to be really considered. A rich chocolate cake, fruit flan, a lemon meringue, a pistachio cake, a fruit mouse and a battenburg and a lemon posset took centre stage. If that wasn't enough when we had finished all of this we were then taken to a cake table to choose a huge slice of homemade cake to end with. I chose to have mine (a banana cake) boxed up to take home with me as I was really quite full. 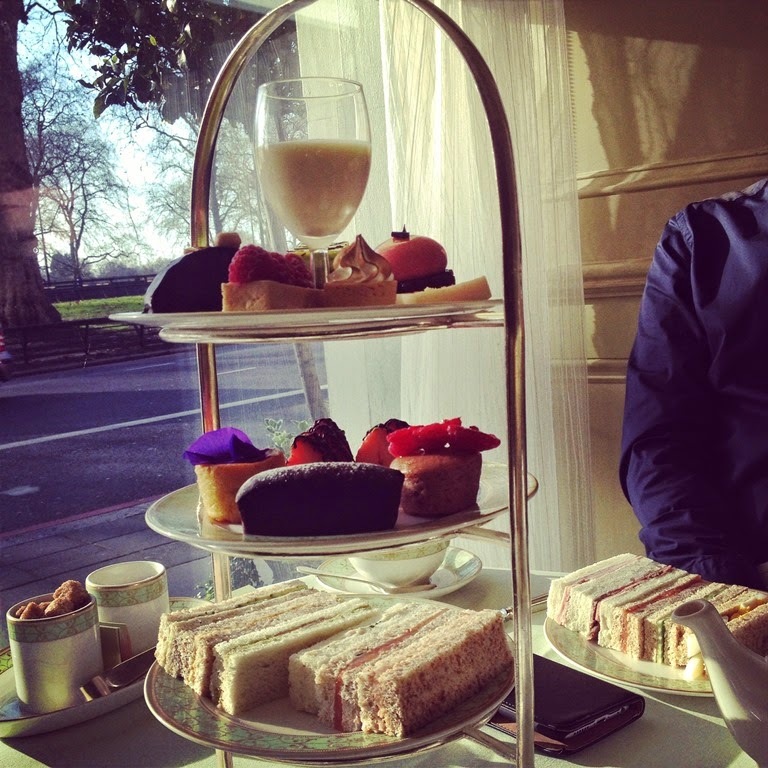 Anna's Afternoon Tea is plentiful, tasty and extremely good value. When we arrived there was only one other couple also having afternoon tea but the room soon filled up with a variety of groups and diners in all age groups. The room had a lovely ambiance to it and being quite big there was plenty of room for everyone without feeling that we were on top of each other, although I could hear mild chatter and laughter I certainly could not hear actual conversations. Part way through our tea a pianist arrived, I personally love the addition of live music and this really added to the whole experience. Our waiting team were friendly and attentive and we couldn't fault the service at all. Anna’s Tea at the Grosvenor House London costs £35.50 per person or £48.50 with Champagne.